Eneco is an international sustainable energy company, with operations in the Netherlands, the UK, Germany, France and Belgium. Eneco says an emphatic No to investment in coal and nuclear energy, and is fully committed to electricity and heating from renewable sources such as wind on land and sea, bio, solar, hydro and geothermal energy. 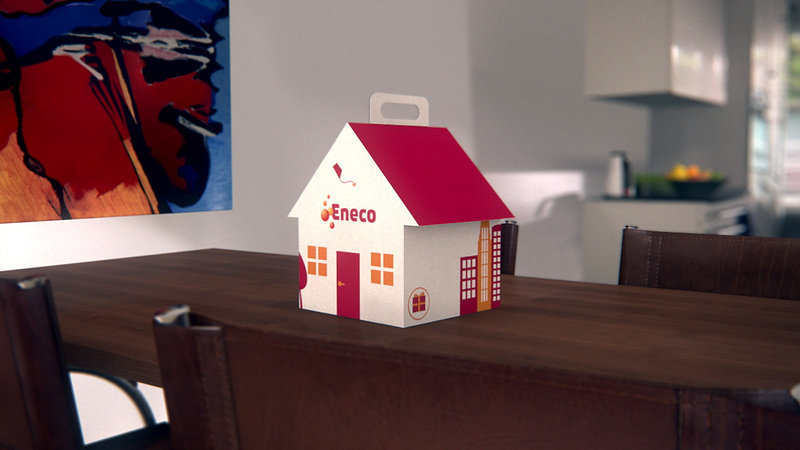 Eneco wants to inform newly acquired clients about the energy they purchase and what they can expect to happen in the near future because of the supply switch they made. In short: Provide every information a new client needs to know. A personal and informative welcome package travels, to the new client, on wind-energy. 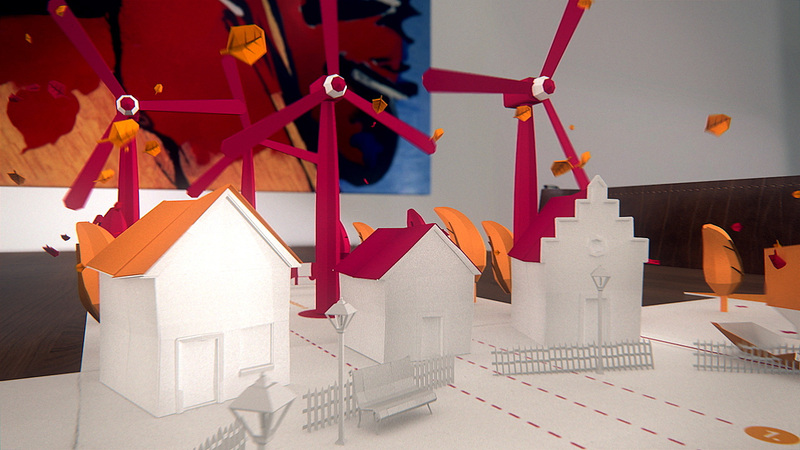 We follow the package on it's journey through a sunny Dutch landscape with wind-turbines. 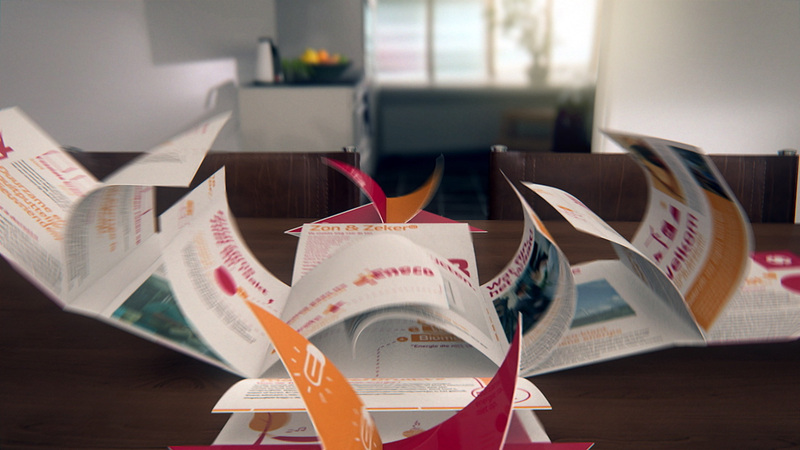 When the package arrives it will inform the client with engaging and interactive content. The animation is used on the web and has several seamless interactive moments. 1. When the package flies over the houses we pass a sign with the place name of the client on it. 2. After the package has land on the table, a welcome mat rolls out. The client has to click on the mat to enter the information in the package. 3. When the package is shown closeup in the house, the camera pans over the box and we see the exact product-name the client has purchased. 4. 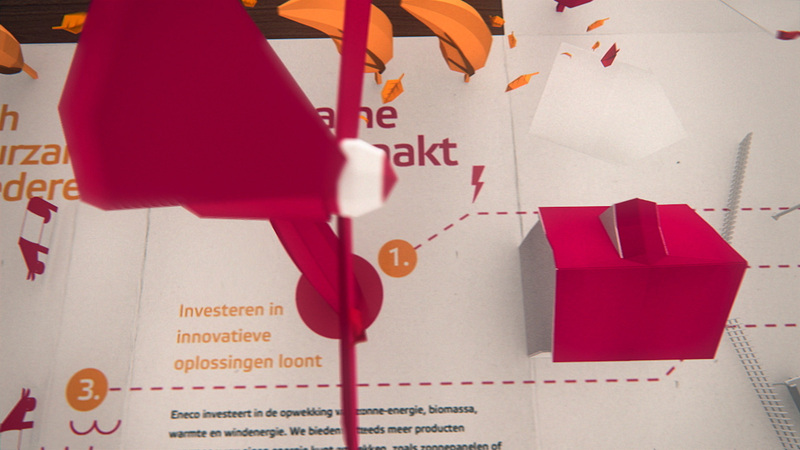 In the middle of the animation there is a seamless transition to interactive in-depth information pages. 5. During the animation the client saves up gift-credits. In the end of the animation the credits will be payed out. The client can choose between three gifts. 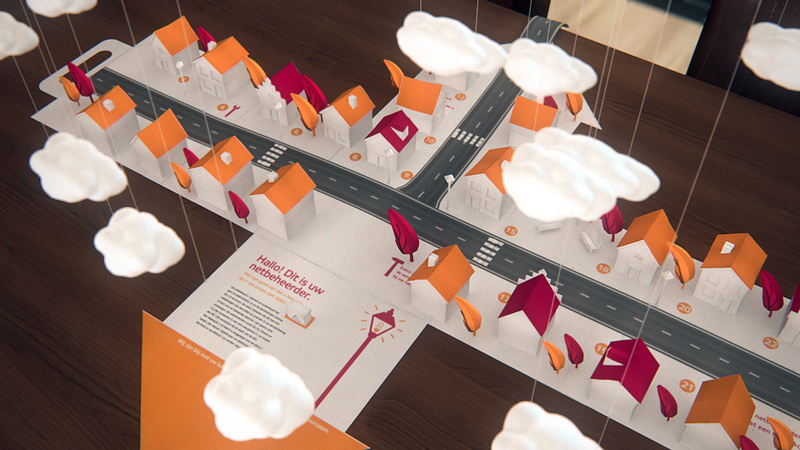 The package contains print which comes to live in popup-style paper animation. The print of the box is also in tune with the voice over. When the voice over speaks about a certain aspect, this is reflected by relevant information in print on the box's surface. 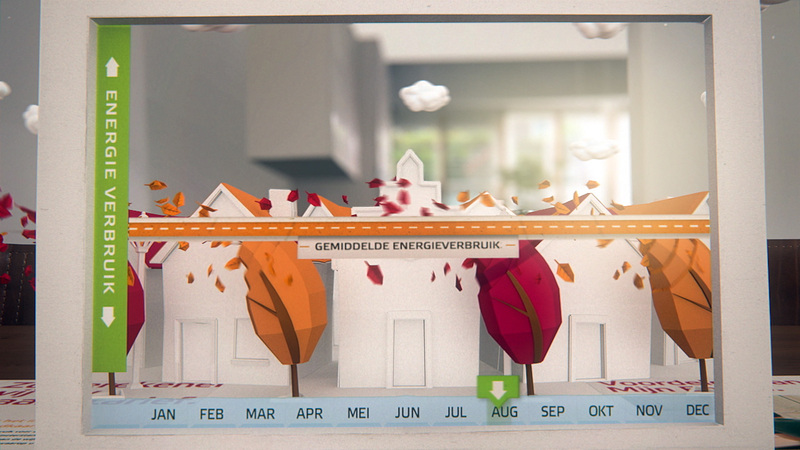 The look and feel of the interactive animation had to be that of Eneco. 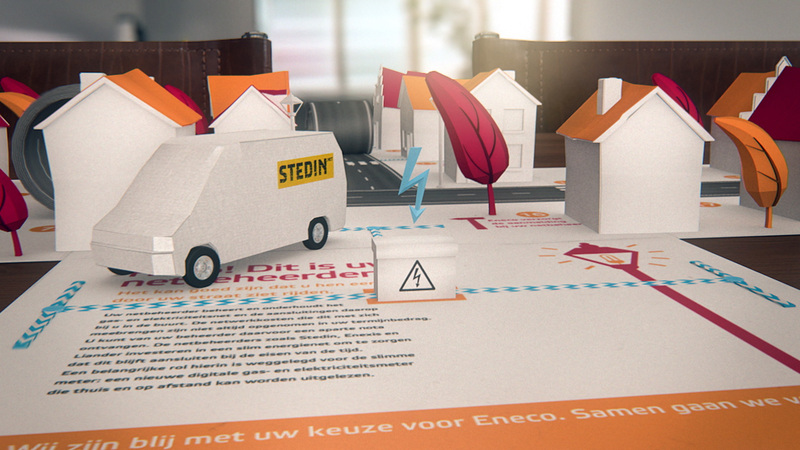 This was achieved by using photographic style of early morning sunshine in combination with Eneco's own graphic style-elements. For the first part of the animation we used aerial footage and we filmed on location for the street, exterior an interior shots. 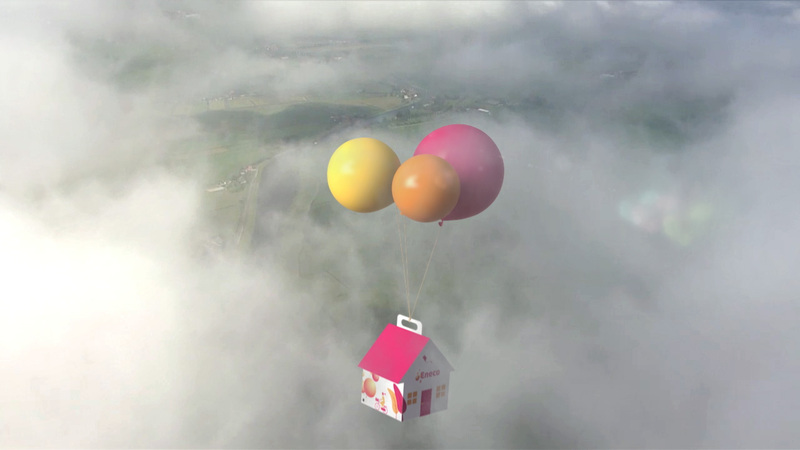 After 0:32seconds the interior is completely made in 3D to have maximal freedom in camera movement.